Three ways brands need to co-work with retailers in order to stimulate new growth opportunities. Kantar Worldpanel, the leading expert in consumer behaviour, reported 2.6% growth in fast moving consumer goods (FMCG) in the first half of 2017. The weaker growth was underpinned by a further drop in purchase frequency. However, growth in average prices and the urban population has contributed to market growth. 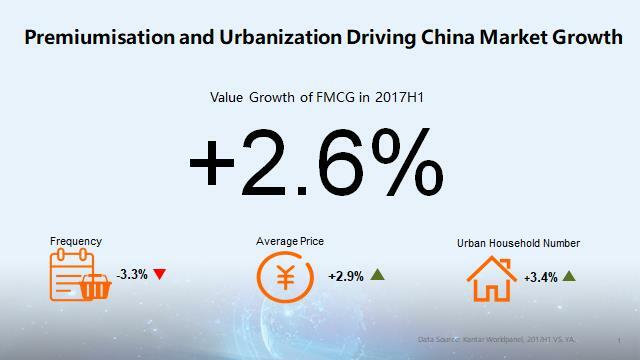 In the years to come, premiumization and urbanization will continue to serve as main growth engines, despite sluggish volumetric trends. Underneath this moderate growth of the FMCG market the dairy sector reported a noticeable slowdown whilst the personal care sector remained buoyant, reinforcing the ‘lipstick effect’ often quoted by economists. In the first 6 months of 2017 the ecommerce channel continued to post strong growth of 28%. Large format stores in China took a more retrenched position by opening less large stores and expanding into diversified formats, while out-of-home (OOH) consumption brought a new land of opportunities. Amongst over 100 categories monitored by Kantar Worldpanel two thirds of them still reported positive growth, with mouthwash and other emerging categories leading the pack. Close to 80,000 new products were found in the market for the first 6 months, approximately 62% of the total number of launches in 2016. This indicates that brand owners are making relentless effort to woo their shoppers through innovations and renovations. Since Jack Ma, founder of Alibaba, advocated the concept of ‘New Retail’ in a conference in November last year, the words were praised and discussed extensively in the retail sector. In his words ‘new retail’ is about the integration of online, offline, logistics and data across a single value chain. Empowered by its data-centric asset and technology (e.g. artificial intelligence), the model is set to reconstruct the three essential elements of business – consumers, products and places and moments. 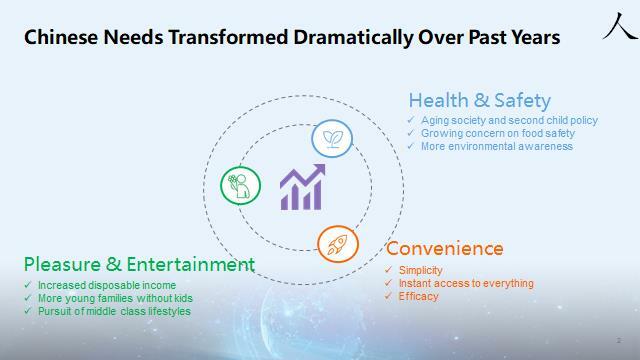 Over the last five years the needs and wants of Chinese consumers have transformed dramatically, shifting from basic functions and quality to health and safety, as well as experience and efficacy. Millennials in China are more willing to buy products for pleasure and entertainment and share their experiences through social media. In the age of selfie, brands will have to establish engagement with those new shoppers and turn them into followers. Pechoin, a Chinese skin care brand with a wide consumer reach, proved that a brand with 86 years’ heritage can attract young consumers through effective use of social media. Online marketing campaigns such as “Unhappy Chinese Beauties” in 2016 and “Chinese Odessey” in 2017 brought the brand under spotlight and received enormous exposures and mentions in different social media networks, demonstrating a successful rejuvenation of a brand and an increase in penetration amongst young buyers. In addition, ‘Jiang Xiaobai’, a Chinese White Spirit (Baijiu) brand, is able to successfully win over Chinese millennials by building a community around the lifestyle that Jiang Xiao Bai depicts, which speaks directly about the dreams, desires and hopes of China's millennials. Consumers are always looking for best price and quality ratio when it comes to purchase choices. In the new retail era, technology and experience will empower brands to take on competition on a different level, therefore completely changing the rules of game. 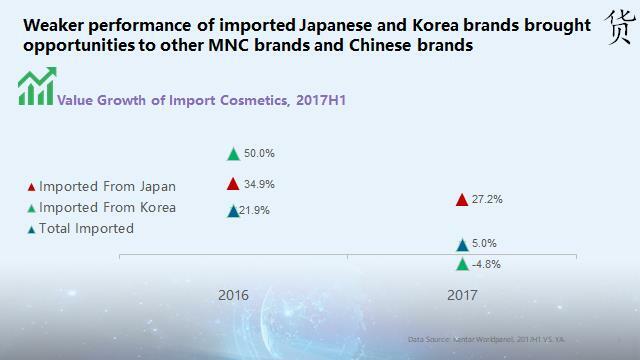 In the first half of 2017, imported products reported a significant slowdown, impacted by the weaker performance of products from Korea and Japan, due to political reasons and product scandals. This gave opportunities to the rise of international brands made in China as well as domestic brands. Multinational brands as a whole reported some recovery in terms of both their consumer reach and their basket spend. Some of the brands launched more high-tech products to please consumers, for example Rejoice’s Micellar Water non-silicon shampoo. In May, Oreo launched its special Music Box edition with exceptional success, with the 20,000 boxes selling out in 2 hours on Tmall. This case demonstrates how international brands are actively creating a community of followers and driving purchase conversion with a creative brand experience via the ecommerce platform. Over the past three years, the price gap between Chinese brands and international brands has become smaller. A number of Chinese brands introduced their premium lines, riding on the wave of premiumisation and enhancing the value of their brands. The Dali brand entered the premium biscuit market by introducing its ‘Zhenghao’ range which enable Dali to increase its average basket spend by 13%. More recently, Nongfu Spring, a mass packaged water brand, teamed up with NetEase Cloud Music to pick up some 30 music comments and print them on the bottles of Nongfu Spring water. The creative marketing campaign reinforced the equity of this traditional water brands. Today, brands will have to provide convincing reasons for consumers to try the products and even voluntarily recommend the brands to others. Milk tea shops, cinemas, convenience stores are becoming a new land for growth. As consumers’ lifestyles are becoming more active these new moments and places enable new consumption occasions. In the food usage study conducted by Kantar Worldpanel in April 2017, we found that nuts and biscuits are most popular products for afternoon snacks, accounted for 42% of all consumption occasions. 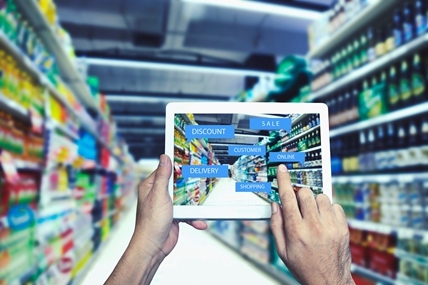 If retailers can activate these opportunities either through their in-store merchandising or real-time alert in their APPs, it could help to drive incremental sales. Hema, the ‘New Retail Model Format’, has created a strong following since its launch at the beginning of 2016. Revamping the traditional supermarket model, Hema provided seamless online and offline integration and in-store leisure dining experiences. Whether online or offline, any shopping experiences that people are willing to share will prevail in the ‘New Retail’ era. 3. 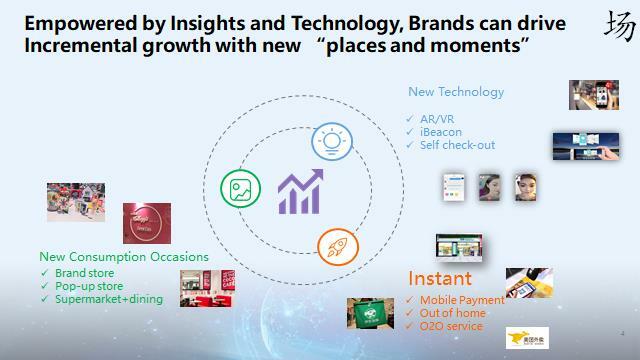 Create sharable shopping experiences, with the empowerment of new moments, smart retailing as well as instant activation.